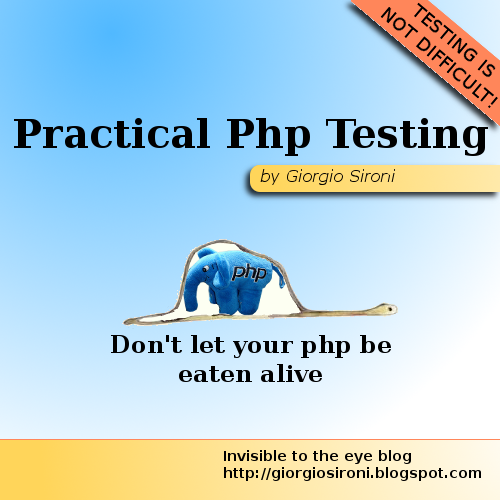 This is the temporary cover of my upcoming ebook, Practical Php Testing. It is a parody of the famous illustration from the book The Little Prince. This publication focuses on testing and designing php code, with the aid of the leading tool for test automation, PHPUnit. 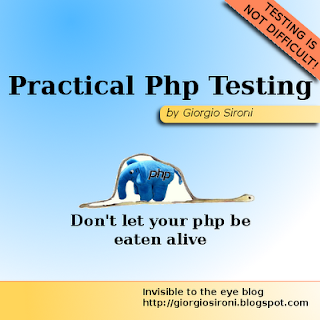 Testing is a skill which is often neglected by php developers, but testable code inherit many benefits of the good design rules it is forced to observe. 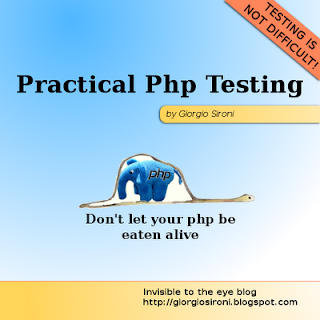 a collection of the articles from the php testing series, adapted to the book format. These articles cover the path from basics such as installing phpunit to advanced features like mocks and code coverage. nicely-formatted working code samples in the form of PHPUnit test cases. I believe teaching by examples is by far more effective than abstract discussions. glossary for must-know terms: it's not cool to consult links while reading a book, so I collect specifical terms at the end of the book. TDD exercises at the end of each chapter, which will help the reader to apply the practices he has just learnt by producing working code, with PHPUnit as the only infrastructure needed. Along with code examples, exercising is the faster way to grow as a tester and programmer. I intend also to include a bonus chapter on Test-Driven Development theory, if there is interest by readers. Practical Php Testing is not a book on TDD, but I think the natural evolution of test-infected programmers brings them to embrace TDD. The size is now around 50 pages, and the book will be published in the first days of December, with Creative Commons license (subscribe to the feed if you want to be notified). You will be free to produce how much copies you want by any mechanical and electronic means (with correct attribution): printing it, sharing it via BitTorrent, emailing it to your friends are things I actually encourage. Also let me know if you would enjoy other testing topics to be treated as bonus chapters. Wow. I will look forward for the ebook. I follow your blog since not so much time, and I found it very interesting! Congratulations for your new book! I'm looking forward to the book as well. Since most of your posts are very informative and professional, I'm pretty sure that the book will be good as well. Very much looking forward to it too! This would be a creditable read for novices but I am thankful that you based your book on PHPUnit and not that pretender Simple Test by Marcus Baker. What a mess that would have been if you had gone down that route. Thanks for this. Will be happy to read your book. The content looks promising!